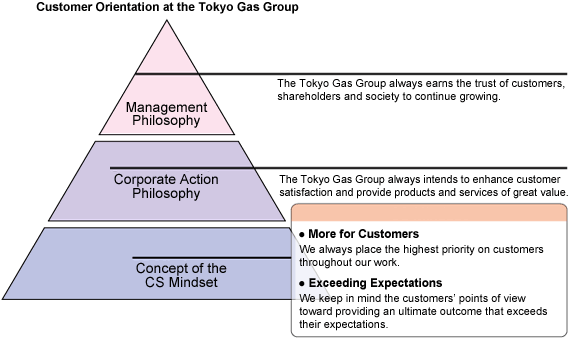 To remain the customer’s first choice, the Tokyo Gas Group believes that delivering customer satisfaction is more important than simply delivering a product or service. With this understanding, we set the CS Mindset as stated in Tokyo Gas Group Our Code of Conduct. Additionally, we intend to be a customer-oriented enterprise by instilling a mindset that guides our judgments and activities throughout Group personnel. We seek feedback from customers through calls to our Customer Center, direct contact and various surveys. The opinions and requests we receive are shared within the company all the way up to top management. They are incorporated into our daily activities as we make improvements and enhance quality. Providing customers with greater satisfaction is high on our management agenda. Since fiscal 2004, we have been convening the Customer Satisfaction Promotion Committee, which comprises Corporate Executive Meeting members and is chaired by the president. The committee discusses solutions to issues deemed too difficult for individual workplaces or departments to solve as well as issues requiring response by the company as a whole. We also maintain a CS Improvement Promotion Subcommittee, primarily composed of the leaders of departments that come into frequent contact with customers, to promote various measures aimed at enhancing customer satisfaction. Every department and workplace holds CS meetings to listen to customers and quickly respond to their needs. The meetings offer opportunities to receive new feedback from customers, discuss and implement improvements, and consider and share CS measures. We apply the results of surveys to our efforts to meet diversified customer needs. The Tokyo Gas Customer Center receives a wide range of inquiries by phone as the Group’s first point of contact for customers. Toward providing faster and more accurate responses, the center continually strives to improve its service by preparing detailed forecasts for inbound call traffic, optimizing shift work schedules, and creating a new system for receiving inquiries about retail electricity and other new services. We direct customer feedback received by the Customer Center and other points of contact as well as sales personnel to relevant sections so that they can take prompt action if necessary. Information obtained through these processes is stored in our customer feedback database toward recognizing and analyzing customer expectations for the Group and to identify problems that need to be addressed. We received 16,460 items of customer feedback in fiscal 2017, of which 1,260, or 7.7%, expressed gratitude, 1,358, or 8.2%, stated complaints and 13,842, or 84.1%, provided opinions or requests about our system. 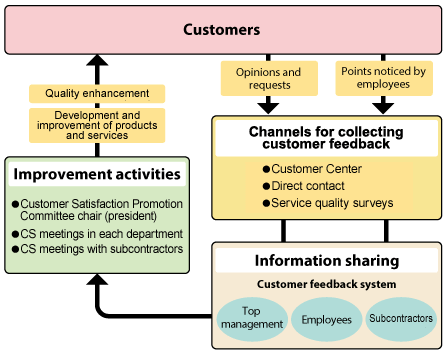 The Customer Center will continue to broadly collect customer feedback, mainly views on our system. Each department uses customer feedback to make improvements. We report back to customers on some of these efforts through our corporate website. I didn’t realize it was a combined bill for electricity and gas, and the breakdown is hard to read. The electricity fee is printed too small. I want to see the breakdown for the electricity bill. Please clearly indicate the amount and period of electricity use. 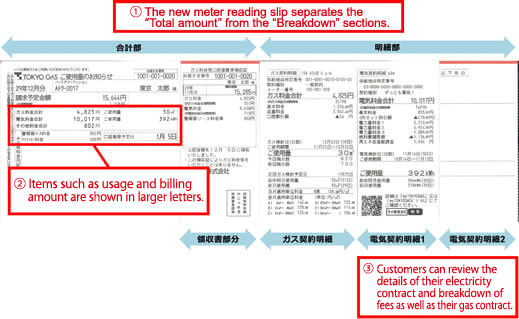 We improved our meter reading slip. The new slip separates the “Total amount” from the “Breakdown” sections. Items such as usage and billing amount are shown in larger letters. Customers can review the details of their electricity contract and breakdown of fees as well as their gas contract. 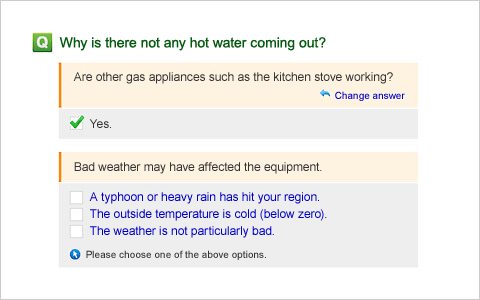 I want Tokyo Gas to provide answers that are easier to understand in the FAQ section of its website. ・After reviewing the FAQs, we added images and video clips to make our responses easier to understand. Note: The FAQs below are the translation of the Japanese website. Please click here for English website. ・We created more specific and relevant answers by providing additional filtering options. We proactively and appropriately disclose information in addition to providing community-based customer support to ensure the safe, secure and comfortable use of energy by customers. 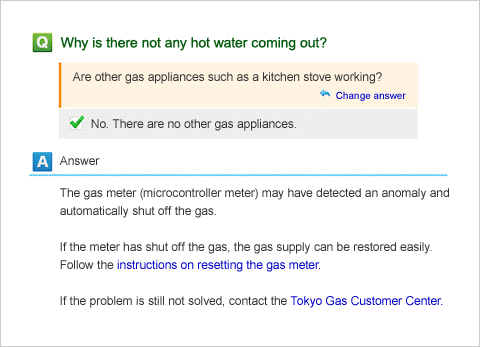 The Tokyo Gas website receives applications for gas and electricity services and provides useful information to customers, such as on how to respond in the event of an earthquake, gas leak or other emergency, as well as lifestyle and living guides. We provide information for both individual and organizational customers and disclose corporate information. We also operate a membership website for customers of our electricity and gas services. Residential customers can refer to the myTOKYOGAS membership website to confirm monthly gas and electricity usage and exchange points earned through their patronage for points offered by tie-in partner companies, various member privileges, environmental activities or contributions to the Japanese Para-Sports Association. The myTOKYOGAS Business site provides commercial and industrial customers with a service that visualizes monthly gas and electricity usage. Tokyo Gas has been providing Heat Shock Forecasts, jointly developed with the Japan Weather Association, on the JWA’s tenki.jp website since October 2017. The service displays heat shock potential calculated from indoor temperature differences on the basis of weather prediction information and is intended to highlight the need to take baths safely in the winter. On the myTOKYOGAS membership website for residential customers, we provided personalized heat shock forecasts tailored to specific indoor conditions after having the customer enter information such as the type and age of their house. Our information on bath use patterns of customers and expertise on housing and air-conditioning equipment contributed to the development of the heat shock forecast service. 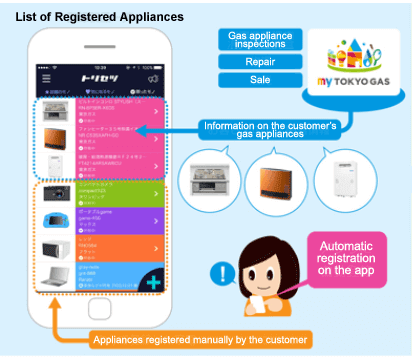 We have been providing a free-of-charge service since autumn 2017 that allows for the integrated management of information on gas and electronic appliances at home through the integration of the Torisetsu user guides through the smartphone app of TRYGLE Co., Ltd. with myTOKYOGAS. A customer simply enters their myTOKYOGAS login ID into Torisetsu to automatically register their major gas appliances. 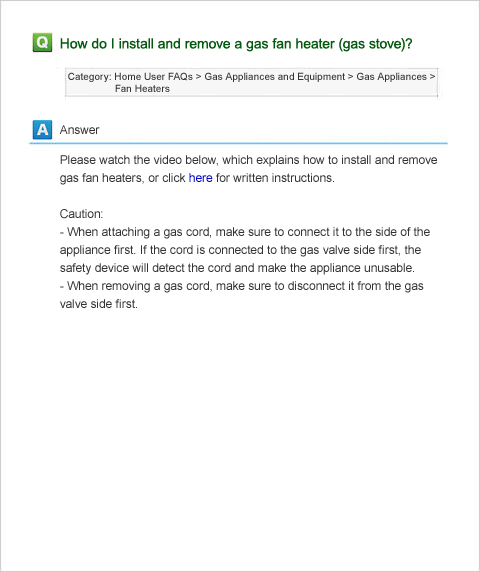 Customers can easily obtain user guides for gas appliances and contact information about nearby LIFEVAL and Enesta service outlets in the event of an emergency. The Web version of Torisetsu will have additional functions starting in summer 2018 so that it can be useful for more customers. In July 2017, we launched an audiobook service that allows users to listen to books read aloud while taking a bath. Furomimi was jointly developed with OTOBANK Inc. and QUANTUM Inc. with the concept of aural refreshment. 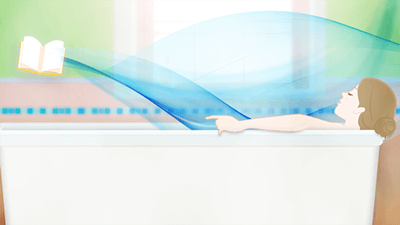 Using waterproof smartphones, users can enjoy taking a bath with Furomimi, which provides original content such as stretching exercises for use in the bathroom as well as voice training and books. 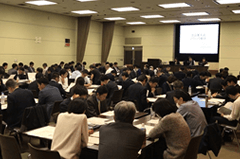 Tokyo Gas has an official Facebook page to offer instant access to our information. We post our seasonal information, recipes and other useful information for everyday life, including entertainment content such as Paccho’s (Tokyo Gas’s mascot character) Diary and disaster preparedness information on the safe use of city gas. Despite the Tokyo Gas Group’s continued efforts to ensure the proper provision of necessary information on products and services, the commissioner of the Consumer Affairs Agency in July 2017 issued a cease and desist order against an event flyer that allegedly violated the Act against Unjustifiable Premiums and Misleading Representations. The Group has taken the incident seriously and is redoubling its efforts to ensure compliance with the law and properly advertise and label products and services. We will continue our efforts to provide proper information in cooperation with legal affairs personnel in the production of flyers, catalogs and pamphlets. We remain committed to ensuring the proper provision of information and labeling in accordance with the Japanese Industrial Standards (JIS), guidelines of such bodies as the Japan Gas Appliances Inspection Association, our in-house regulations and other rules, so that consumers can confidently use Group products and services. To ensure that customer can safely use our products and services, we also abide by the guidelines for appropriate information provision and other matters that the Ministry of Economy, Trade and Industry has set forth in concert with the full deregulation of the electricity and gas markets.